"Bridge for the world Divided - Making Book Accessible And Knowledge Affordable"
Post Box : 515, Post Mall, F-7, Islamabad. Saeed Book Bank at Islamabad, is the most beautiful and most modern book shop and also the largest showroom of books of the sub-continent, with covered area of over 24000 square feet; having an inventory of over 2,00,000 imported titles on all subjects. 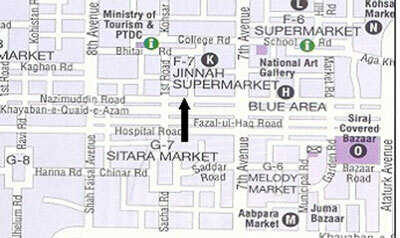 It is situated at Jinnah Super Market, F-7 Markaz Islamabad, right in the heart of the capital city. This is a complete book shop, worth visiting, where you can find the largest variety of all kinds of books, under one roof. From the Airport, Rawalpindi Railway Station and Public Transport bus stand take a taxi for F-7 Jinnah Super Market, or take one of the buses/ Coaches that comes to that area. From Motorway/Grand trunk (GT Road) or from any area ahead towards F-7/3 Sector and then for Jinnah Super Market, the center Porsche shopping area in the town. A very large car parking for over 300 cars is available in front of Saeed Book Bank, where car parking is easily available at all times. Parking is free all day / night and on Sundays and holidays. Islamabad is located in the lap of crescent shaped Margalla hills, correctly recorded as ' Mar-I-Qila' which in Persian means " The hill fort of the serpent " Centuries ago this region was ruled over by Takkas who were Turanians by race and decedents of Zohak, the Iranian king having two snake like tumours on his shoulders. The takkas were snake worshippers and they founded Taxila the world known ancient centre of art and learning. The ancient Taxila, now in ruins, lies on the western slopes of the Margallas while Islamabad the modern capital of Pakistan is located on the eastern slopes of the Margallas. In the ancient days Texila was the capital of the powerful Buddhist empire and attracted monks and missionaries, traders and various parts of the world. But then time and tide of natural forces knocked out Taxila and it remained buried under dust for several centuries. It was rediscovered just about a few decades ago during 1912-1920. Along with the ancient Taxila a new Taxila is now coming up fast and that is the industrial Taxila. Today it can supply even the cement and sugar manufacturing plants as well as very heavy type of arms and ammunition including tanks. It is also known for eye operations and handicrafts. Today Islamabad, through a city in the making , also attracts important personalities including Presidents and Prime Ministers almost from all parts of the world. And there is no doubt that the development of Islamabad will revive our centuries old historical and culture links with Afghanistan, Iran, Turky, the newly independent states of the Centeral Asia and the Mid. East as well. Communication links, highways and railways are being planned and development work may begin very soon. Physical features of the Federal Territory exhibit a richness and variety which is continental in dimension. There are mighty mountains, verdant valleys, pleasant plateaus, fragrant forests, fertile fields, treacherous torrents and pretty plains. The area offers such a variety of topography which the physical forces could produce during the course of ages. Federal Territory is dissected by eight rivers and several streams. Names of the major rivers are, the Soan , the Harro, the Ling, the Sarin, the Ghamlan, and the Tamrah etc. The Tamrah and the Harro, after their merger, were so force-ful that they were once known as the tiger of the east. During the past few years many beautiful man-made lakes have been added to the landscape of the area. There is Tarbella on the one side and Mangla on the other. In between and around the city there are the Simly, the Khanpur, the Missriot, the Tanaza, and the Rawal lake. All of them have their own charms and attractions. Besides these gifts of nature the area occupies a unique position in the history of civilizations. It was here, in was there, in this region, when man struggled against the strong and brutal forces of nature for his existence in the Soan valley during the Interglacial ages. The stone implements recovered from some of the terraces cut by the river Soan in the material deposited by the melting ice-field during interglacial phases provide a significant proof about the struggle for human survival which was staged here as far back as about half a million years ago.